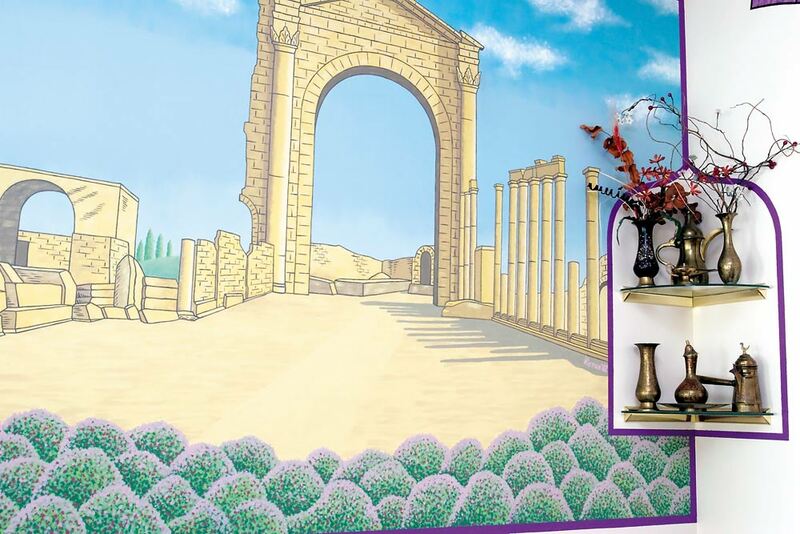 Step inside the door at Aladdin’s Palace Restaurant in Silverdale and you are greeted with a picture of Rachaya, Lebanon, a small mountain town located below Mount Hermon, southeast of Beirut. That is where the Nakkour brothers Fayez and Kamal grew up and learned the secrets of their national cuisine. 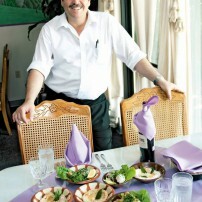 Fayez, who owns Aladdin’s, came to the United States ahead of his younger brother, eventually opening the restaurant in its current location in 1994. 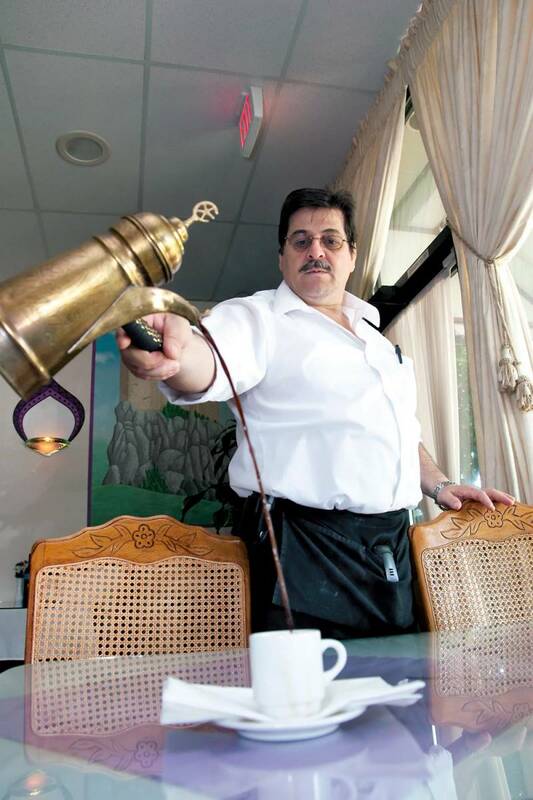 Kamal came from Lebanon in 1976 and worked in the restaurant business in several locations, including the Space Needle in Seattle, before finally settling at Aladdin’s. 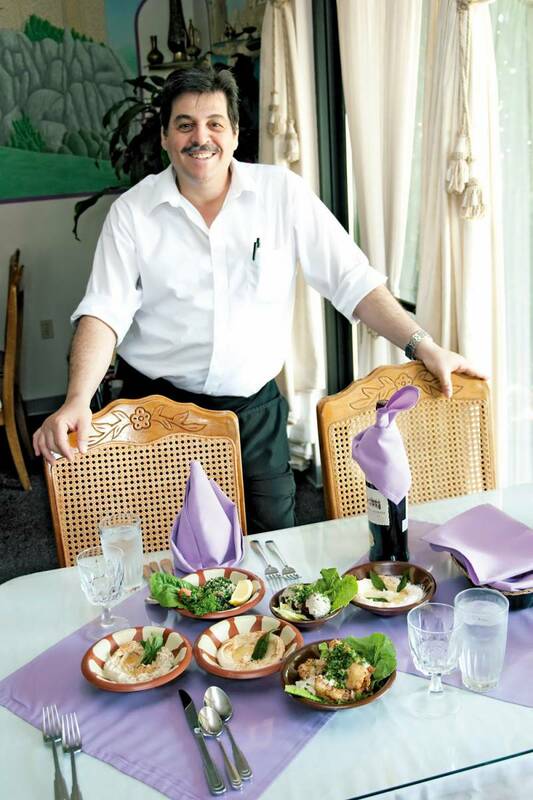 The family also owns and runs the Omar Al Khyam Restaurant in Renton. “We learned from our mother the taste and the delicacy of Lebanese cooking,” says Kamal, who manages the 60-seat restaurant. 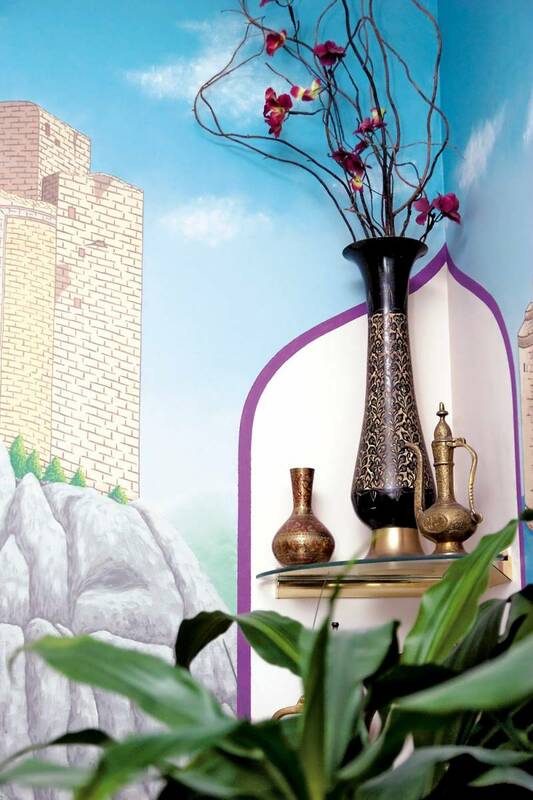 His wife, Bassima, who Kamal says is “the artist behind the cooking” (along with his brother), can be found alongside her husband six days a week carefully attending to the many dishes that have made Aladdin’s a local favorite. “We work all together as a family. It’s better than working for someone else,” Kamal says. 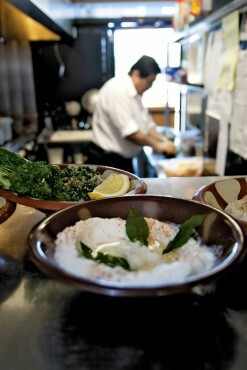 It also allows them to exercise strict quality control over the food. 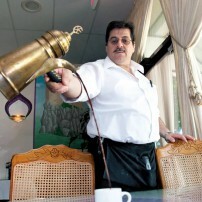 Everything at Aladdin’s is made from scratch from family recipes, according to Kamal. 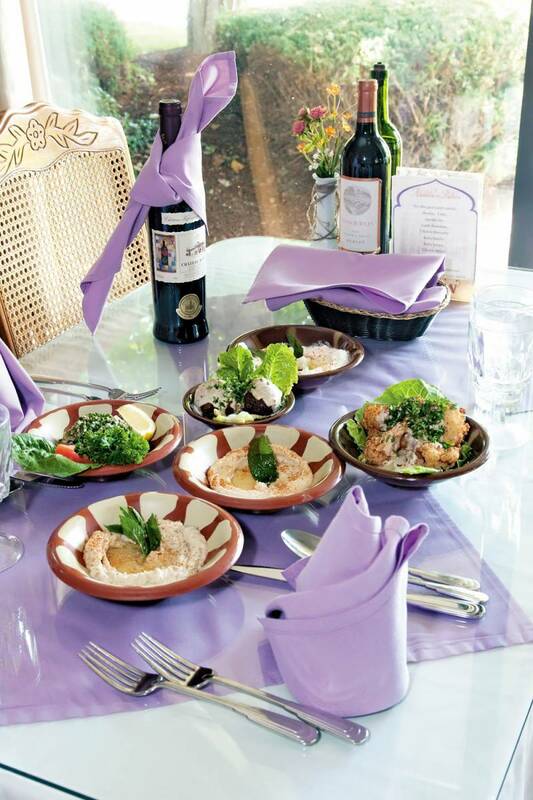 Although Aladdin’s advertises itself as Mediterranean (a broad definition, since at least 16 countries surround the Mediterranean Sea including Greece, Italy and Spain, to name a few), the cuisine is strictly traditional Lebanese. Still, anyone familiar only with Greek food, its more ubiquitous cousin, will notice plenty of similarities and probably recognize a few favorites. 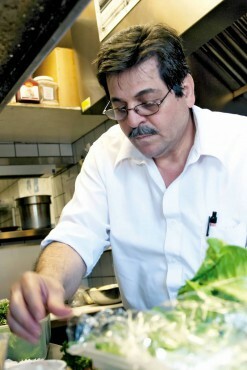 The difference between the two cuisines is mostly seasoning, Kamal says. 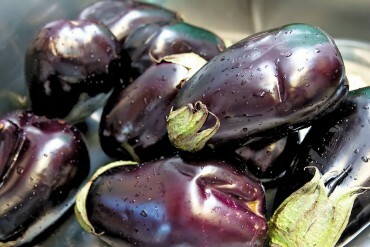 They both rely heavily on vegetables and grains, with olive oil being the primary fat. 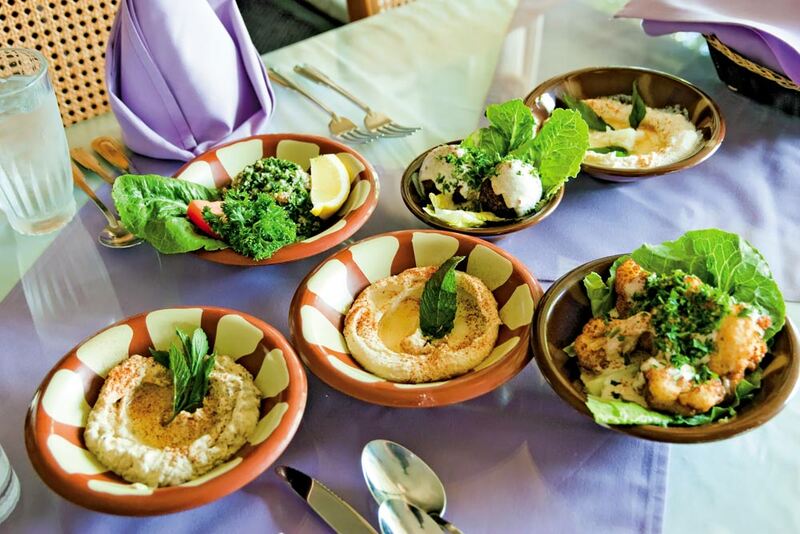 The menu at Aladdin’s can easily accommodate vegetarians, but there is also a tasty array of fish, chicken, lamb and beef dishes to tempt the palate. Take, for instance, that perennial favorite dessert baklava, a delectable blend of nuts wrapped in multiple layers of phyllo dough generously brushed with butter. 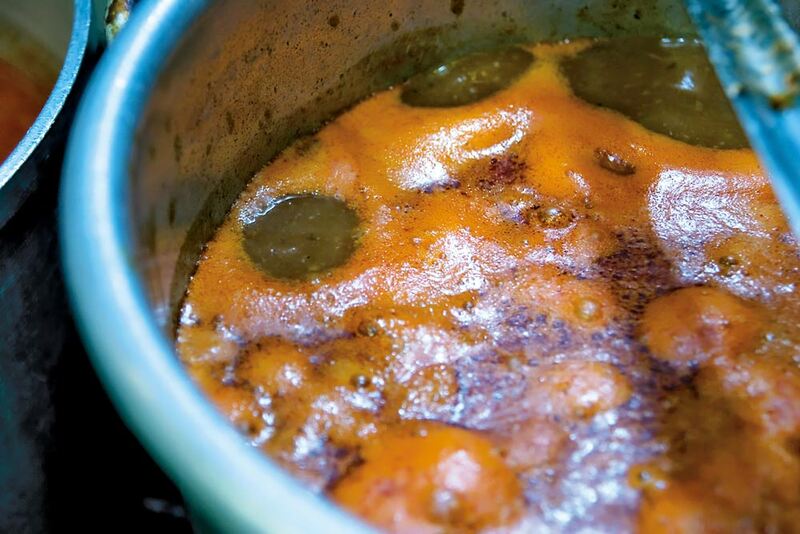 The Lebanese version, which is lighter than the Greek, is made with walnuts, pistachios and almonds and sweetened with rose water and simple syrup rather than cinnamon and honey. “It’s the best baklava you’ll ever have,” Kamal says as he presents it with a pot of Arabic coffee, sweetened and flavored with cardamom. It’s a perfect and not overfilling way to end the meal. But first things first. 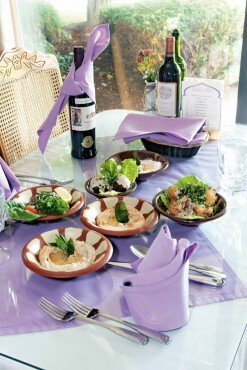 A good way to sample the subtleties of Lebanese cuisine would be to order an appetizer platter, or meza. 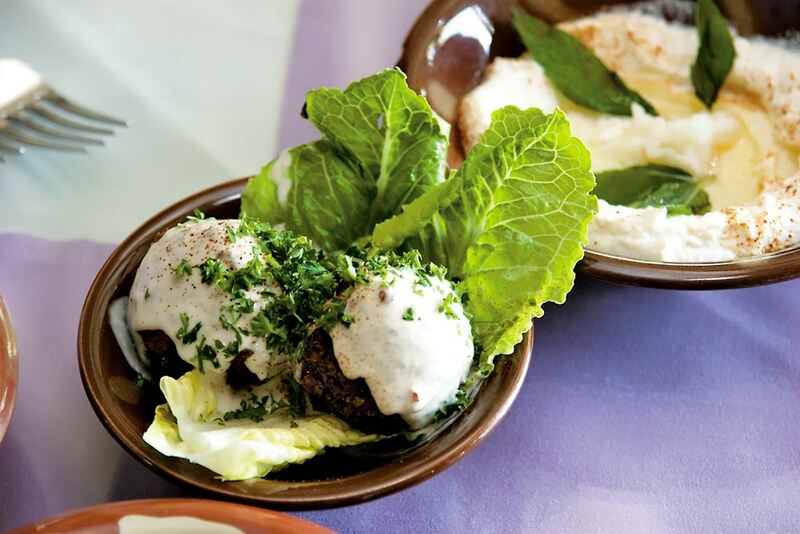 Here you will find hummus, probably the most widely known Mediterranean dip, as well as baba ghanoug, the wonderfully smoky eggplant dip that’s also mixed with lemon and tahini. 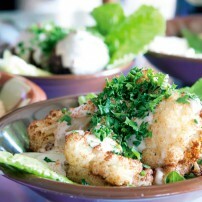 You’ll taste tabouli, a bulghur wheat salad fragrant with parsley and mint, and vegetarian stuffed grape leaves. 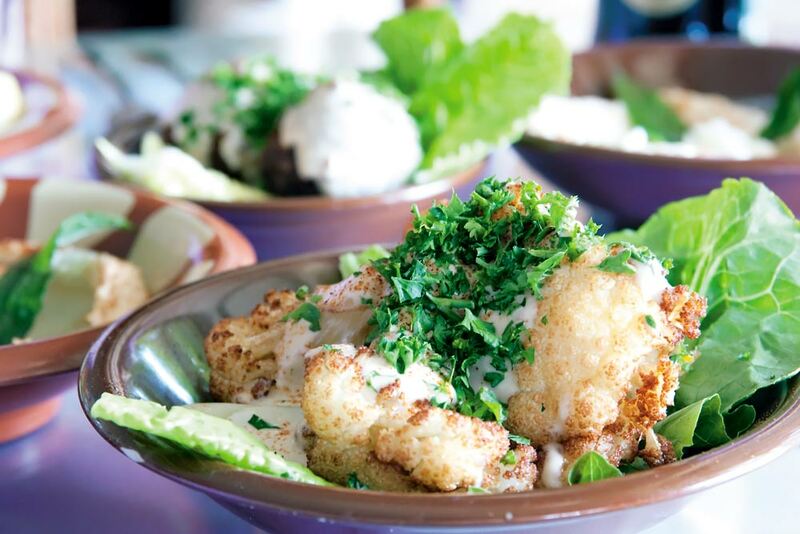 And then there’s Zahra, cauliflower that’s been deep fried (“in a way that doesn’t absorb oil,” Kamal says) and topped with a lemon tahini sauce. According to Kamal, there are patrons who come in specifically for this one dish. “Each item has its own followers,” he says. Meat eaters have a variety of familiar and lesser-known dishes to choose from. 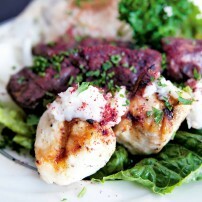 There are beef gyros as well as grilled lamb and beef kebabs. But also on the menu are shish tawouk, lemon and garlic chicken served on a bed of onions accompanied by hummus, and several preparations of lamb, including lamb sharhat, marinated in lemon juice and garlic and served with grilled onions and tomatoes (Aladdin’s own hot sauce optional). There are even chicken wings, though not the sports-bar variety — these are marinated in lemon juice and spices, deep fried and served with garlic puree. 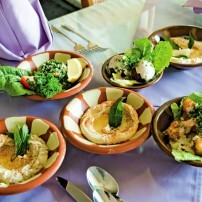 In addition, Aladdin’s prepares grilled halibut and salmon with a lemon tahini sauce. Vegetarians need not go hungry, with choices like eggplant moussaka as well as falafel, the deep fried garbanzo bean patties served both as an appetizer and full entree. 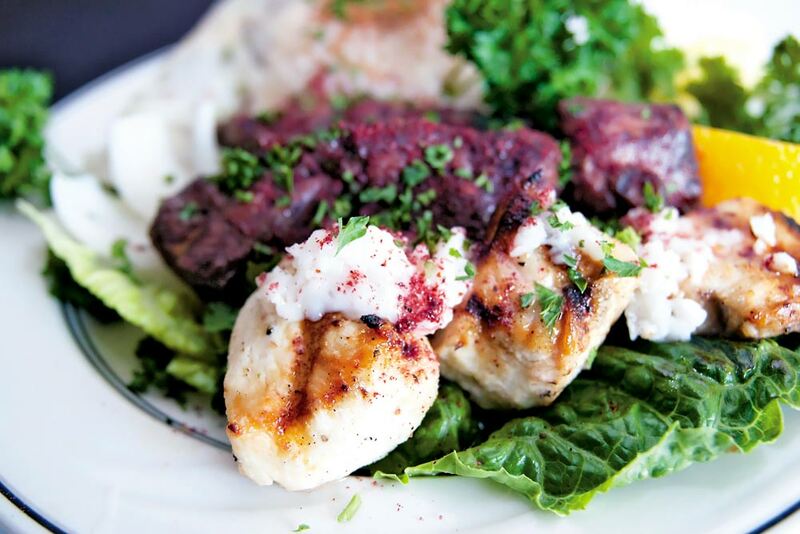 Or there is an entree-sized Greek salad as well as fatoush, a traditional pita bread and vegetable salad tossed with house lemon dressing. And everyone should try the fresh homemade yogurt that accompanies many dishes but also serves as the basis for tatziki, the tart dip flavored with fresh mint, garlic and diced cucumbers. Although there isn’t a separate lounge, Aladdin’s does offer a full bar as well as beer and wine selections. If you’re really in the spirit of things, you can try a Lebanese wine (a 2002 Chateau Kefraya Vin Rouge sells for $45 a bottle, a 2006 Chateau Kefraya Red Table Wine for $27). 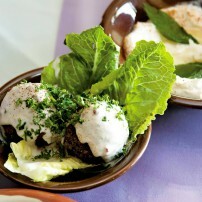 Or try a shot of Arak, the Lebanese Ouzo. Whatever you decide on, you’ll find yourself wanting to linger. The traffic of a busy intersection rushes by outside, but inside Aladdin’s, the sound isn’t audible, thanks (most likely) to some good insulation and music. 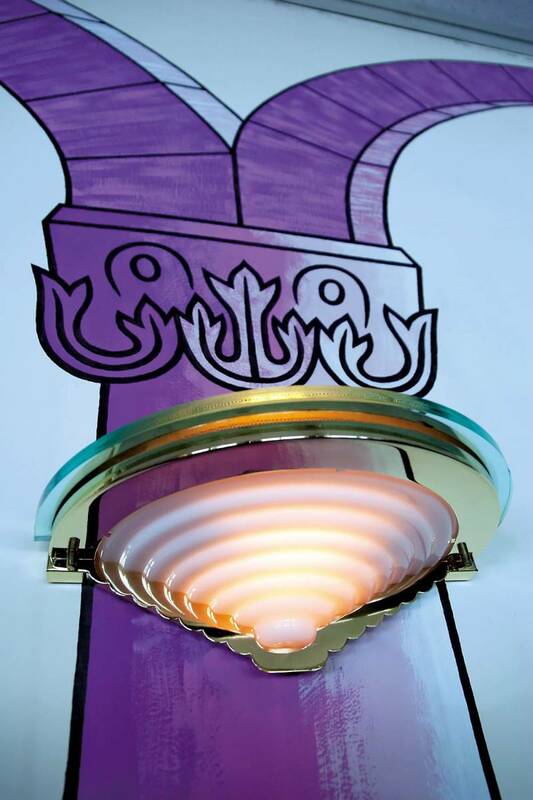 “The music of the Mediterranean just flows,” Kamal says. It certainly adds to the feeling inside of a peaceful oasis in the midst of all the busyness around it. 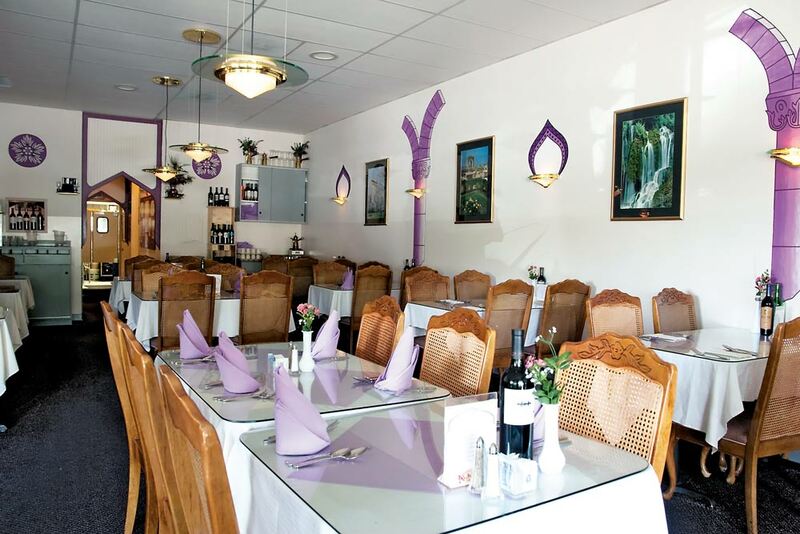 Kamal believes this atmosphere is part of the reason the restaurant draws people from as far away as Port Townsend, Shelton and Sequim. 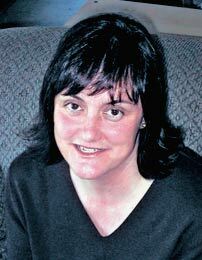 “We have people that come here to spend a couple of hours. It’s quiet. People can talk,” he says. Aladdin’s offers catering for special events as well. For more information and to see a menu, visit www.aladdinpalace.net.